Enrolment for residential courses is restricted to students 17 years of age and over. Enrolments will be treated on a first come - first served basis, therefore an alternative choice of dates would be mutually helpful. Provisional enrolments will only be held for up to one week, after which they will be deemed to have lapsed. Enrolments for a course will only be binding where we confirm in writing the receipt of a completed enrolment form and deposit. All fees are payable in full six weeks in advance. A non-returnable deposit, whether residential or non-residential, is payable on submission of the enrolment form. The deposit will be returned if for any reason the enrolment is not accepted. Please make all payments by cheque, credit card payments over the phone or direct deposit into our bank account. Cheques are to be in sterling (GBP) and made payable to 'Cookery at the Grange Ltd.'. Alternatively a direct deposit can be made to our bank. Fees will be returnable subject to deduction of the deposit if written notice of cancellation is received at any time prior to six weeks before the start of the course. If you cancel within six weeks of the course start date, you will be responsible for payment of the full fees. It is recommended that insurance be taken out against cancellation for reasons outside the student's control. If you terminate during the course you are not entitled to the return of any proportion of the fees. There is no smoking anywhere inside the buildings. Wear appropriate clothing, low heeled and non-scuff shoes in the kitchen. Any property belonging to students is brought to The Grange at the student's own risk and the proprietors accept no responsibility for any loss or damage to the property of any students, nor do they accept any liability for any personal injury to any student except such as is imposed by statute. The Grange does not accept responsibility for any injury to any student when not on the property. Students are expected to conduct themselves in accordance with the highest standards during their residential course and the proprietors reserve the right to order any student to leave without reimbursement of fees if the student does not observe such standards and any regulations of The Grange or is guilty of unreasonable or improper conduct. Fees and Dates are quoted as at the time of going to press. We reserve the right to make alterations as and where relevant. You will be notified immediately of any changes. 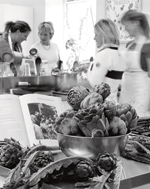 Cookery at The Grange reserves the right, under unavoidable circumstances, to alter the timing or content of any course or of the curriculum and to substitute any teacher or instructor or to cancel a course at any time. A certificate is awarded at the end of The Essential Cookery Course. A letter of recommendation may be given on the successful completion of the course where achievement and hard work show students to be sufficiently competent to use their training in a future career.